Valkyria Chronicles II is a Tactical-Action RPG for Playstation Portable published by Sega. Released on August 26, 2010, it is a sequel to 2008's Valkyria Chronicles on Playstation 3. 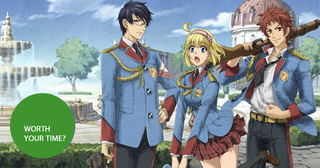 Set two years after the end of Valkyria Chronicles, the game follows the school lives of Avan Hardins and his classmates at Lanseal Royal Academy as they try to prevent a civil war from tearing Gallia apart. This game was the subject of a considerable amount of controversy when announced the series from PS3 to PSP. Let's find out if this game is worth your time. Valkyria Chronicles II's gameplay system is very similar to the first game, expertly combining the tactical mechanics of a strategy RPG with those of a third person shooter. It's a wonderful system and does feels extremely satisfying to use. Players oversee the battlefield from a bird-eye view before taking control of a unit and guiding them to complete a wide range of task such as attacking enemies and capturing enemy camps. The gameplay system has undergone a few tweaks since the first game, with battles taking place on several smaller battlefields connected by camps rather than on one big map. Units can withdraw and deploy from camps on the same turn, making strategy reliant on properly moving units among the maps. This was a very welcome change, making the gameplay much more fast paced and adding a new level of strategy. In addition, Valkyria Chronicles II fixes the prominent balancing issues from the first game in terms of difficulty, making the gameplay a strong point of improvement. Valkyria Chronicles II follows the school lives of Squad G at Lanseal Academy, centering upon the exploits of Avan, Zeri and Cosette. The story is relatively light-hearted and really emphasizes the school atmosphere while also incorporating the horrors of war in the story to a degree. However, the story does not compare especially well to the first Valkyria Chronicles because lacks the same sort of gravitas and the stakes feel much smaller in comparison. However, it still compliments the gameplay well thanks to the inclusion of a better focus on supporting characters and is good in its own right. The characters in Valkyria Chronicles II are likeable and have well-realised backgrounds. The main cast of characters are well-written if a little bit simplistic, and they do not receive the same quality of character exploration the charaters of the first game did. The game does do a great job of encouraging players to utilize a wide range of supporting characters, using character-specific missions as a catalyst for further character development. One of the best features in the Valkyria Chronicles series is the class upgrade system where characters take on the level of their class, allowing characters to be switched in and out with ease. Valkyria Chronicles II retains this system, but adds on a further requirement for individual units to reach the second and third-tier levels of their classes, with credits earned by units through the completion of missions used for this system. These credits are semi-randomly assigned and add a lot of unnecessary clutter to the leveling system that is just not needed and impedes the gameplay experience. The move from PS3 to PSP was the subject of significant controversy among fans of the series, and for good reason. Unfortunately it's difficult not to feel that this game is held back by the limitations of the PSP, and not as powerful an experience compare to the first game due to the reduced scale of the story and battlefields. In addtion, it's a shame that the beautiful CANVAS engine is not used here as the water-colour inspired art-style of the first game has been replaced with a more anime-styled art design. It's a bit of a tough pill to swallow considering how beautiful the first game was, and definitely needs to be noted. The gameplay is fantastic and is a great improvement on the first game. If you're looking for a great strategy game, you've found one here. The story is not as good as the first game, and the school setting is not as compelling. It's still good though and a lot of fun. The scale is reduced in the move from PS3 to PSP. It's disappointing but the strength of the gameplay outweighs this. The transition from PS3 to PSP should not hold back fans and series newcomers from playing this game. The strong gameplay system is a joy to use, and the game retains the spirit and energy of the first game, providing a compelling and engaging gameplay experience. It is one of the best games on PSP and anyone looking for a strategy RPG wholly unlike any other should take a hard look at Valkyria Chronicles II. I'll be taking on Valkyria Chronicles 3 E2 later this summer, look for my thoughts on it later this year! You can find Valkyria Chronicles II for $29.99 at VideoGamesPlus and for download for $9.99 on Playstation Network.